For many people, including myself, a mention of the word wasp brings to mind a particular yellow and black annoyance found hovering around garbage cans in the summertime. However, as is usually the case with the natural world, wasps are far more interesting than our common experiences with them let on. To start, there are thousands upon thousands of species, not just the yellow jackets we try to avoid being stung by as we eat at a picnic table out in the park. Wasps are close cousins of bees and ants. Some live in groups, but most are loners (solitary wasps). Many wasps, as adults, feed upon sugary liquids (be they nectar, rotting fallen apples, or unfinished cans of soda). It's a whole other ballgame when it comes to their young though. Solitary wasps have a tendency to lay their eggs inside other living things, including oak trees and various insects. The larvae then feed upon their living surroundings. As many of the insects consumed by wasp larvae themselves consume plants we like to eat, look at, or make things from, wasps are a big help to us. 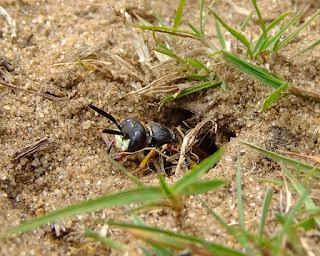 Beewolves refer to several genera of bee-hunting solitary wasps. In addition to having an awesome name, they are involved in a neat mutually-beneficial symbiosis. Females dig underground nests in which to lay their eggs. They then go out and capture bees by injecting them with a paralytic venom, bringing them back to the nest as fresh food for their offspring. After devouring the immobilized bees, the wasp larvae encase themselves in cocoons and undergo metamorphosis. Adults emerge the following summer. 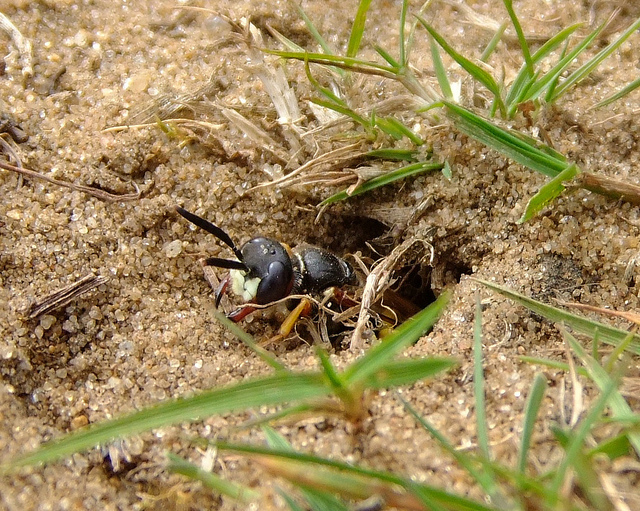 Now, the soil surrounding a beewolf nest is typically filled with a diverse collection of bacteria and fungi, some of which are capable of infecting and killing the larvae as they hang out in their cocoons. This is particularly likely since it's fairly warm and humid inside the nest, ideal growth conditions for many microbes. To minimize the chances of infection, beewolf mothers douse their nests with a white liquid they release from glands within their antennae. These glands happen to house an antibiotic-producing bacterium belonging to the genus Streptomyces. The bacterium is taken up by the larvae as they construct their cocoons, providing protection against bacteria and fungi seeking to get inside and chow down on the immature wasps. Imaging of the outside of the cocoons has revealed they are thoroughly coated with protective antibiotics. The beewolf Streptomyces produces at least nine different antibiotics, making it difficult for disease-causing microbes to develop resistance to their collective lethal effects. That a species of Streptomyces should be producing antibiotics is of no surprise. This genus is responsible for many of the antibacterial and antifungal drugs we use to treat our infections. We isolated them from the soil in which they lived and uncovered the killer compounds they were pumping out. While we've only gained access to their antimicrobial weapons in the last hundred years, beewolves have been using Streptomyces to ward off infections for tens or millions of years now!